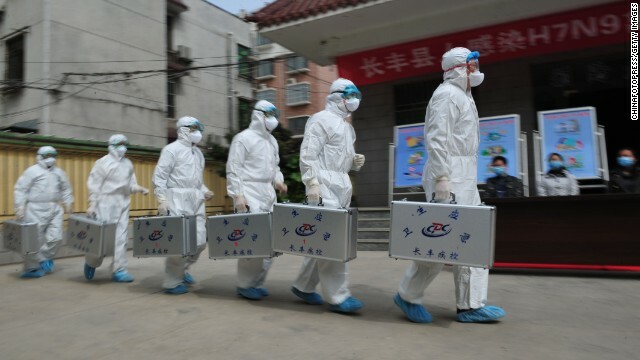 In China eight people have so far died and at least 16 are seriously ill in the latest outbreak of bird flu H7N9. However as this information went to press today 13th April 2013 it is now feared that the death toll could even be higher than expected to even rising now out of control. The death toll could even rise higher because the virus has already three of the five mutations that we know would allow another bird flu outbreak H5N1 to spread between mammals which is now seen by ourselves and others as a “category 1 environmental concern” the highest warning level given for this type of virus outbreak within the environmental, agricultural and medical world. No one knows for sure if the five mutations discovered last year by Dr Ron Fouchier and colleagues at Erasmus Medical Centre in Rotterdam, the Netherlands will do the same thing in H7N9. But we do know that some form of the mutations helped viruses from three other influenza families go “pandemic” which is very concerning as this explains to us that the virus is traveling rapidly and will soon if not brought under control cause a catastrophic loss of mammal and non- mammal life. Chinese authorities are at this moment tracing contacts of known cases to see whether the infection has already spread between humans. Two more people with H7N9 only show mild symptoms, so the authorities are trying to establish how often it makes people seriously ill. Most recent pandemic viruses have been hybrids of birds and mammalian flu, and therefore relatively mild because mammalian influenza tends to be less severe in people than bird flu. Pure bird flu viruses, like H5N1, and H7N9, are more potentially dangerous. The most lethal pandemic we know of, which spread across the world in 1918, was a pure bird flu that acquired mutations that allowed it to spread in humans, Virologists fear that the H5N1 has spread widely in birds, but it has not evolved the ability to spread rapidly between mammals (as yet). Dr Fouchier’s work – which came under fire because of fears that it would allow bioterrorists to engineer an H5N1 pandemic shows that in principle, is can spread between ferrets, with no obvious loss of virulence. To get transmissible H5N1, Fouchier first had to prime the virus with three mutations known to adapt bird flu to mammals, and then allow the other two requisite mutations to evolve within the animals. Two of the three deliberately added mutations allow the HA surface protein from bird flu in the H5, H2 and H3 families to bind to cells in mammalians noses. The viruses that broke out in 1918 from the H1 family – had similar mutations with the same effect. Such binding mutations have never have never been seen in the wild H5N1 – but H7N9 already has one of the two. If the H7N9 can bind to mammalian cells it could adapt even further to mammals, just as Fouchier’s primed H5N1 did in his ferret experimentations. If what we know about these mutations in other flu subtypes is also the case for this virus, then it’s already part way there, of which the University of Cambridge confirmed too which now has many environmentalists, scientists and medical practitioners to hospitals extremely worried and we have a right to be concerned now as of this evidence and further investigations that are still continuing. The viruses also has a second of Fouchier’s mutations in a polymerase protein which allows the powerful replicating enzyme that makes bird flu so virulent to work at mammalians temperatures. This mutation has been present in all pandemic viruses. The third mutation in H7N9, which led to the spread of the H5N1 in Fouchier’s work removed a sugar group from the HA. That leaves only two more mutations, both in HA, before this H7N9 has Fouchiers five. All pandemic viruses have acquired this [mammalian cell] binding and polymerase activity stated “Fouchier”. “The H7N9 has these characteristics so the question now is what else does it need – if anything? Many experts warn that the world is overdue, and unprepared, for a global influenza pandemic. The next outbreak could well be as deadly as the Spanish flu, also known as H1N1, and potentially leave tens of millions dead. Currently experts can’t determine exactly which viruses might spark pandemics, though the Spanish flu data may help to identify which strains bear close observation. H5N1, a strain of avian influenza called the bird flu, is the most likely candidate. The largely Southeast Asian disease is commonly found in birds but also occurs in mammals like pigs, cats, and humans. It has killed several dozen people, but as of yet it cannot be easily transferred from person to person and so has not developed into a pandemic outbreak. This new work could aid researchers in monitoring the HA mutations in the H5N1 avian flu strains currently circulating in Asia. Epidemiologists fear these mutations could enable the virus to jump from birds and spread between humans–a possibility that could trigger millions more deaths than the 1918 pandemic. In January, Sasisekharan and colleagues reported in Nature Biotechnology that flu viruses can only bind to human respiratory cells if they match the shape of sugar (or glycan) receptors found on those cells. The glycan receptors found in the human respiratory tract are known as alpha 2-6 receptors, and they come in two shapes–one resembling an open umbrella, and another resembling a cone. To infect humans, the MIT team found that avian flu viruses must gain the ability to bind to the umbrella-shaped alpha 2-6 receptor. In the current study, the team discovered that two mutations in HA allow flu viruses to bind tightly or with high affinity to the umbrella-shaped glycan receptors. “The affinity between the influenza virus HA and the glycan receptors appears to be a critical determinant for viral transmission,” said Sasisekharan. These earlier findings correlate with the viruses’ ability to bind to umbrella-shaped alpha 2-6 glycan receptors, demonstrated in the current PNAS study. NY18, which is only slightly infectious, binds to the umbrella-shaped alpha 2-6 receptors, but not as well as SC18, which is highly infectious. AV18, which does not infect humans, does not have any affinity for the umbrella-shaped alpha 2-6 receptors and binds only to alpha 2-3 receptors. Another strain, TX18, binds to alpha 2-6 and alpha 2-3 but, because it binds with high affinity to the umbrella-shaped alpha 2-6 receptors, is much more infectious than NY18. Other authors of the PNAS paper are Aravind Srinivasan and Karthik Viswanathan, postdoctoral associates in MIT’s Department of Biological Engineering (BE); Rahul Raman, research scientist in BE; Aarthi Chandrasekaran, graduate student in BE; S. Raguram, visiting scientist in BE; Viswanathan Sasisekharan, visiting scientist in the Harvard-MIT Division of Health Sciences and Technology; and Terrence Tumpey of the Centers for Disease Control and Prevention. Phase 6, the pandemic phase, is characterized by community level outbreaks in at least one other country in a different WHO region in addition to the criteria defined in Phase 5. Designation of this phase will indicate that a global pandemic is under way. During the post-peak period, pandemic disease levels in most countries with adequate surveillance will have dropped below peak observed levels. The post-peak period signifies that pandemic activity appears to be decreasing; however, it is uncertain if additional waves will occur and countries will need to be prepared for a second wave. Previous pandemics have been characterized by waves of activity spread over months. Once the level of the disease activity drops, a critical communications task will be required to balance this information with the possibility of another flu outbreak wave, pandemic waves can be separated by months and an immediate “at-ease” signal may be premature. Could the below information be related to the recent high poaching rate’s in South Africa? The charge was first reported in the state-run Guangzhou newspaper Southern Metropolis Daily and then picked up by several news outlets in Asia. State Department spokesman Jason Rebholz dismissed the claim. “There is absolutely no truth to these allegations,” he told the Washington Free Beacon. Seven deaths from the bird flu outbreak were reported as of Tuesday in state-run Chinese media. As many as 24 people reportedly were infected by the disease in Shanghai, Jiangsu, Zhejiang, and Anhui. Chinese authorities are trying to calm public fears of a major epidemic, claiming there is no evidence the virus can be transmitted between humans (this is untrue though and why was the American government so angered at Dr Fouchier’s work?). The government also is claiming that the outbreak is not related to the recent discovery of thousands of dead pigs floating in a river in China. “At that time, America was fighting in Iraq and feared that China would take advantage of the opportunity to take other actions,” he said. “This is why they used bio-psychological weapons against China. All of China fell into turmoil and that was exactly what the United States wanted. Now, the United States is using the same old trick. China should have learned its lesson and should calmly deal with the problem.” Dai said that even if “a few may die” from the flu outbreak, it will not equal one-thousandth of the deaths caused by vehicle accidents in China. The Pentagon has been trying with varying success to develop closer ties to the Chinese military as part of a strategy aimed at building trust. However, China’s military leaders believe the U.S. offers of closer ties are a ruse designed to contain China’s growing military build-up. Defence Secretary Chuck Hagel spoke by phone with China’s Defence Minister Gen. Chang Wanquan on April 2. Chang is the No. 4 defence official after Chinese President Xi Jinping and two other generals who run the Central Military Commission, the Communist Party’s ultimate power organ. “The leaders both expressed their intention to work together to continue to build a military-to-military relationship that serves the vision of both President Obama and President Xi,” Pentagon press secretary George Little said in a statement after the call. “The secretary discussed the importance of focusing on areas of sustained dialogue, practical areas of cooperation, and risk reducing measures,” he said. U.S. ties with China are strained due to China’s reluctance to rein in neighbouring North Korea. China provides North Korea with large amounts of fuel oil and other goods. However, Beijing has not taken steps to pressure Pyongyang using its economic leverage during the on-going crisis. The flu has lit up China’s thriving Internet, according to analysts. Over 945,600 micro blog postings addressed the flu between April 8 and 9. Since the outbreak began some seven days ago, between 1.3 million and 3 million postings were put online on outlets including Sina Weibo and QQ Weibo. The proximity to the initial outbreak in Shanghai and the river has led to speculation that the pig deaths may have been linked to the flu virus jumping from animals to humans. That speculation was fueled by reports that one of the victims of the flu was a pig butcher. The avian flu strain is similar to an earlier outbreak with a significant difference: The current strain does not kill the birds it infects, making it more difficult to identify infected poultry. The Shanghai government waited 20 days before announcing the first H7N9 infection on March 31. A genetic analysis of a bird flu strain responsible for at least nine human deaths in China suggests it could evolve to adapt to human cells, researchers say. A study led by researchers from Japan’s National Institute of Infectious Diseases with colleagues at the University of Wisconsin-Madison examined the genetic sequences of the H7N9 pathogen from four of the human victims as well as samples derived from birds and the environs of a Shanghai market. “The human isolates, but not the avian and environmental ones, have a protein mutation that allows for efficient growth in human cells and that also allows them to grow at a temperature that corresponds to the upper respiratory tract of humans, which is lower than you find in birds,” UW-Madison researcher Yoshihiro Kawaoka said. Although it is too early to predict its potential to cause a pandemic, Kawaoka said, signs the virus is adapting to mammalian and, in particular, human hosts are unmistakable. Avian influenza rarely infects humans but can sometimes adapt to people, posing a significant risk to human health, the researchers said. “These viruses possess several characteristic features of mammalian influenza viruses, which likely contribute to their ability to infect humans and raise concerns regarding their pandemic potential,” Kawaoka and his colleagues reported. The first human cases were reported on March 31 by the Chinese Center for Disease Control and Prevention, and the new virus has sickened at least 33 people, killing nine. This entry was posted on April 13, 2013 by speakupforthevoiceless. It was filed under You must be the change you want to see in the world and was tagged with bird flu outbreak, climate, flu viruses, mammal life, science, virus outbreak.